We Indians love fixed income instruments, hence over Rs 110 lakh crores sit in bank fixed deposits (FD) and over Rs 10lk crores (over 50% of total MF AUM) in debt mutual funds. What most of us don’t know are the various alternatives that exist which are better than bank FD’s, namely Government Securities (G-Secs), Corporate bonds, Tax-free bonds, and more. Over the last 8 years, thanks to all your support, we have been able to become the largest retail stock brokerage by trading turnover and 2nd largest by active clients. We are now working on introducing fixed income instruments, educate, help you invest and optimize returns. In order to meet its fiscal expenditure, the government has to borrow money. The RBI issues T-bills and Bonds on behalf of the Govt to raise money by offering a fixed return on investment. Very similar to how banks give interest on fixed deposits and use that money to lend to others, Govt uses it to run our country. G-Secs is a collective term for these two type of securities: maturities less than 1 year are called T-bills and those more than one year are called bonds. Make sure to read this chapter on Varsity which explains about G-secs in detail. G-Secs across maturities offer higher yields compared to bank FD’s. You can potentially lockin the interest rate for as long as 40 years whereas FDs have a maximum tenure of 10 years. 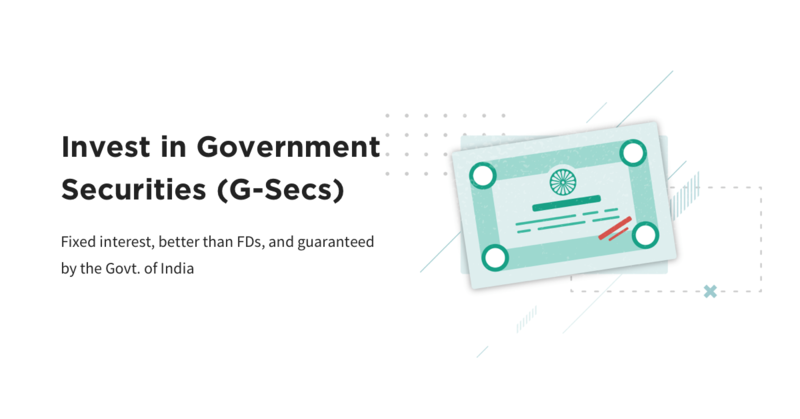 G-Secs are guaranteed by Govt of India and are virtually risk-free, unlike bank FDs. Did you know that if a bank defaults, deposits are only guaranteed up to Rs 1 lakh under deposit insurance and credit guarantee scheme of India. Debt mutual funds can lose value, as you must have realized in the last few months during the NBFC crisis. The exchanges open a non-competitive bidding window every week for G-Secs. Bids for T-Bills are collected from Monday to Tuesday and for Bonds from Tuesday to Thursday with cut-off time at 8 PM. Apply using your Zerodha account and the funds will be deducted from your trading balance. G-Secs will be credited to your demat upon successful allotment within 2 days and all interest payments will be credited to your bank account. Head over to coin.zerodha.com/gsec and click on Invest now. Place an order against the G-Sec of your choice. The minimum amount is Rs 10,000 and multiples of 10,000 up to Rs 2 crores can be applied at one time. Help spread the word on a much better alternative to bank fixed deposits. Based on the response we will start working on offering other instruments like corporate and tax-free bonds. Make sure to check out for taxation and more on varsity module on G-Secs. Would you allow pledging of Gsecs for margin ? Hey Rajat, working on it. I think zerodha must provide margin by pledging against g sec otherwise it makes no sense that risk-averse people will take so much pain of opening demat account, placing order etc. just to take marginal benefit than FD especially in times when Auto sweep facility in banks provides FD returns with 100% liquidity. Kal kyun brokerage free trading session de raha Diwali ewe pe?????? So dat u wanna make people wiped out easily?????? Nice move. Is it possible to pledge the g-secs for collateral margin? Hey Shyam, we are figuring this out. liquid funds invest in T-bills and bonds then investing in those liquid funds is beneficial or investing personally is more beneficial ? ?is there any charges difference or it only hold on our demat ac ? That’s great!!! economy finally moving to retail participation. How is this income or loss treated for income tax purposes? Hey Anand, check this chapter on Varsity: https://zerodha.com/varsity/chapter/government-securities/. Looks good. What about charges and tax? 0.06% or Rs 6 for every Rs 10,000 invested will be charged as brokerage. 0.06% (ie, Rs 600 for every Rs 10 lacs invested) is very high. Will there be a brokerage on withdrawal also? Can The G-Secs bought in Demat be pledged for margin in trading account ? Just like shares, LiquidBees, MFs, etc. If yes, On FD there is NO haircut, i.e. 100% margin grranted. Presume no haircut in on G-Secs as well. Please confirm ? I do not think Zerodha allows pledging MFs as margins? banks give 90 p.c margin on fd for loan. Hey Neeraj, we are working on enabling pledging. We have been hearing from last 3-6 months that Zerodha is working on enabling Pledging on MF’s & now you have added G Sec’s as well, appreciate if you can inform all of us on the timelines, to keep you updates, lot of investors/traders are moving to different brokers due to this feature. While this is a nice feature to have, promising a timeline wouldn’t be possible. While we do intend to allow pledging of mutual funds and g-secs, I would be remiss to promise you a date. Hey Amer, the post all the details. But if you want to learn more about how G-Secs works, check this chapter on Varsity: https://zerodha.com/varsity/chapter/government-securities/. Hey Tanuja, we are working on enabling pledging of G-Secs. See the maturity of the G-Secs in the picture shared. Can we use the G-Secs as collateral with zerodha online? Hey Abhay, we are working on enabling pledging of G-Secs. So if i invest in 3 month tbill for 4 times a year, I make 24% a year? You wish! Nah, the mentioned rate are annualized. Hey Aneel, the yield shown on the T-bill is annualized. It’s best if you check out the Varsity chapter on G-Secs: https://zerodha.com/varsity/chapter/government-securities/. What is interest on bond security and t bill? You can find the indicative yields in the GSec page. Hey Shiji, the advantage is that these securities are guaranteed by the government and you get assured interest. The interest rate differs across different securities. You can check the interest rate by logging in here: http://coin.zerodha.com/gsec. For example, this is the name of the security “7.72% GS 2055”. The first 3 digits denote the interest rate. Hey Arun, we’ve explained the taxation bit here: https://zerodha.com/varsity/chapter/government-securities/. if you wish to sell your bond, you can write to us and we’ll help you out. What are the tax implications of a G-Sec? Is it as tax efficient as a conventional debt fund? Hey Vijay, we’ve explained the taxation bit here: https://zerodha.com/varsity/chapter/government-securities/. Looking for details (If possible with a example).. New to this..
Hey Sandeep, we’ve explained more about these securities with examples here: https://zerodha.com/varsity/chapter/government-securities/. Hey Rama, these securities aren’t listed on the exchanges yet. Hey Arup, 0.06% or Rs 6 for every Rs 10,000 invested will be charged as brokerage. No other charges. Hello Bhuvanesh, Is the brokerage charged on withdrawals too? Awesome initiative Nithin. Let’s people invest safely directly on G-Secs. No more depending on 3rd parties and worry about commissions! You should introduce other instruments like corporate and tax-free bonds. Hey Ashwin, this is just the first step to gauge the response, since these are the safest securities. But yeah, we do have plans to offer corporate bonds and tax-free bonds. What about gold bonds issued by RBI can i invest in that also?? Hey Kaushik, yes, you can. Just head over https://zerodha.com/gold/. After bidding & buying, can we later sell them in secondary market? Hey, these bonds aren’t listed on the secondary market yet. The exchanges have said that they will be listing these securities. But if you wish to sell, you can get in touch with us. How is the taxation calculated? Hey Ash, we’ve explained the taxation bit here: https://zerodha.com/varsity/chapter/government-securities/. There are no penalties involved if you wish to sell prematurely. You can get in touch with us and we’ll help you out. Hey Ashwin, there are no penalties involved if you wish to sell prematurely. You can get in touch with us and we’ll help you out. Sir, may I know about tax treatment of G-Sec? How is the repayment of interest & principal? Hey Shripad, we’ve explained the taxation bit here: https://zerodha.com/varsity/chapter/government-securities/. How liquid are these G-Secs? And what is the settlement cycle? Hey Abhishek, these securities aren’t listed on the secondary market yet. The exchanges have said that they will be listing these securities. But if you wish to sell, you can get in touch with us. Can I trade the T bills and Gsec bonds, if I am in need of cash? What will be the charges? i am really interested in moving my bank FDs to such type of investment. I am a senior citizen and hence I need liquidity as well. Prakash, these securities aren’t listed on the secondary market yet, so you cannot trade them. The exchanges have said that they will be listing these securities soon. But if you wish to sell, you can get in touch with us. Once they are listed how the trading account will be used to sell them? Can we buy these from secondary market now if there are existing ones being sold? Once they are, it’s just like buying and selling stocks. Will zerodha have this option of trading them in secondary markets? I tried to buy old sovereign gold bonds (around 2 years old) from NSE and BSE and looks like it is not allowed and blocked. G-Secs aren’t listed on the exchanges yet. You’ll be able to buy/sell them on the secondary markets once they are. Bhuvanesh, this is a great initiative! If I want to sell the bonds who do I contact? Can you share contact details? You will provide liquidity at what price? at the current market yield? Can G-Secs bought through zerodha be used as Margin for f&o trading? If not, then when will this start? Hey, not currently but we are working on enabling pledging. Hey Ronit, these securities aren’t listed yet, so not possible to short them yet. wow, simply amazing nithin sir. only you could do this first time in india. simply amazing. can I pledge this for trading margins? Hey Kannan, thanks. You can’t pledge these securities yet, but we are working on enabling pledging soon. After gsec credit in my demat a/c, When and how can sell them.. Is there any fix tenure? If you let it mature, you will receive the funds in your bank account. One more thing.. when interest paid.. is there any fix date or or based on allotment date..
Hey Ashish, interest is paid semi-annually. Here’s the schedule of coupon payments: https://www.rbi.org.in/Scripts/NotificationUser.aspx?Id=11391&Mode=0. This is a great initiative for retail investors. Looking forward to have corporate debt instruments as well. What if I invest in Government sec and say I want to exit after a month, then whom do I sell to, plus would I get interest in proportionate days of investment for that period. Exit is more important than entry. Please clarify. 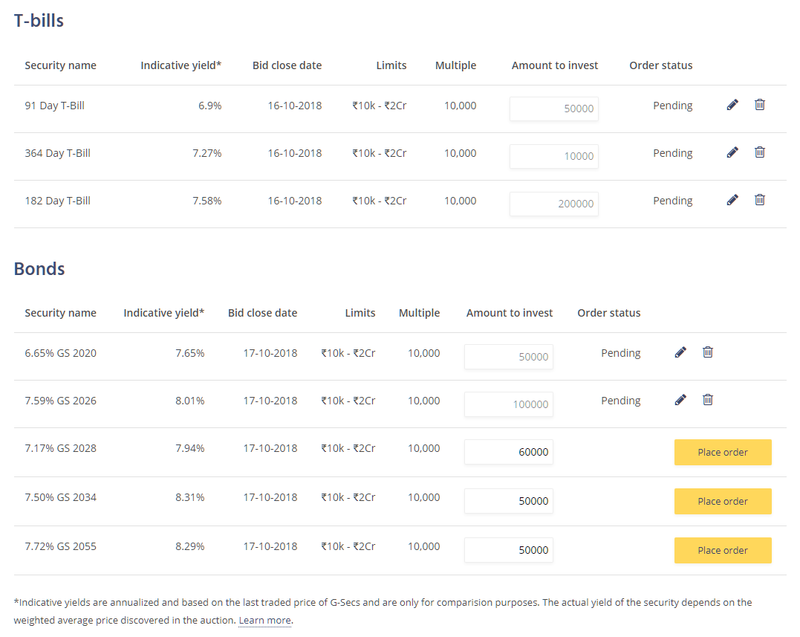 Hey Rajesh, since these bonds aren’t listed on the exchanges, you will have to get in touch with us by writing to [email protected] if you wish to sell. What will be the tax implication on the interest portion..?? Interest is taxed as per the tax slab you belong to. Why will there be any gains when you are getting interest semi annually? Its a great move by Zerodha to bring all instruments available for trading under one common umbrella. Is there a TDS on the interest earned? Hey Agustus, there is not interest component in T-bills. But for bonds, we will record the interest payments on Console. What about those situations when I need money? I can run to bank to borrow some with 1% higher interest rate against FD. What would happen if I need some urgent money? I don’t think the bank would offer you a credit backed by a G-Sec collateral. Even if they were to offer such a credit, I reckon the G-Sec must be of short term. There’s another similar question I have: do I have to remain a Zerodha customer for as many years as my subscribed G-Sec? Hey Banibrata, you can write to us at [email protected], if you wish to exit. Nice option . For bonds, Is interest annually or will be paid at maturity. T-BIlls are discounted, so you will receive the face value at maturity. For Bonds, there is an annual interest payment. What’s the tax implications on investing in G-sec? Hey Siva, we’ve explained the tax implications here: https://zerodha.com/varsity/chapter/government-securities/. This is best platform provide to G-sec buyers. Really done great job Thanks to ZERODHA Team. When will State developmental loans ( SDL) that provide higher interest than G-Sec would be available. Hey Deepak, currently SDL’s aren’t available through non-competitive bidding. We’ll make them available when they are. Can SDLs be purchased on Secondary market through access to NDS-OM. Without SDLs on offer pure G-Sec will not help retailers. It will be a good service to retailers if SDLs through Non-Competitive Bids may be allowed. Hey, what views are you referring to? I’m an amateur investor and I’m not earning any other income as of now. So if I invest in these G-Secs and earn interest, how will it be taxed? Hey Sagar, it’s best if you go through this module: https://zerodha.com/varsity/chapter/government-securities/. When will we get the interest paid? Hey Prakash, interest is paid semi-annually. If the growth rate for a 3 month t bill is 6.5% does it mean my money will increase by 6.5% for three months? I.e. is the growth percentage for the tbill period or annual? Hey Sashank, the T-bill yield is annualized. Would suggest you read this chapter on varsity where we’ve explained this: https://zerodha.com/varsity/chapter/government-securities/. I cannot recollect any broker, anywherein the world who offers this level of technology to retailers. Kudos. Keep going till you blow away ICICI from the top spot. Keep going further after that. Hey Mithun, what seems to be the issue? Just head over to http://coin.zerodha.com/gsec and place an order for the security you wish to invest in. Mutual Funds is not enabled on your account. The exchanges may take 24-48 hours from your account opening to activate your Mutual funds account. Please contact Zerodha support for further queries. If you could explain on each bond and t bill of what is 7.62%bond2025 on the below of every instruments then it will be easy to understand for investor to buy ….now there is simple grid over there and nothing explanation was there …how could I get to know what is indicative yield and what is the meaning of % written in bond name ….see you are doing good job …but think like layman who does not much about the financial instruments but want to save his money in good way . Hey Kanwaljit, fair point. We’ll add this as an FAQ. So, to explain “7.50% GS 2034” 7.50% is the coupon (interest) which is paid semi-annually. 2034 is the maturity year of the bond. If you could explain on each bond and t bill of what is 7.62%bond2025 on the below of every instruments then it will be easy to understand for investor to buy ….now there is simple grid over there and nothing explanation was there …how could I get to know what is indicative yield and what is the meaning of % written in bond name ….see you are doing good job …but think like layman who does not much about the financial instruments but want to save his money in good way ….. The gsec has a fixed coupon but it is traded at a discount and premium in the market. Idbi samruddhi platform does provide similar services but in select securities. Will you be giving the option to invest in all the securities notified for bidding by rbi or also on the secondary platform operated by ccil. Also it’s observed that entry can be easy in the gsec in small lots but in case of exit it becomes very difficult to sell. 1. Yes, all securities that are available for bidding in a given week will be available. 2, CCIL NDS-OM isn’t available as of now. 3. Theexcahnges have sadi that they’ll be listing these securities soon. In the meanwhile, you can write to usa t [email protected] if you wish to sell. Can you please add a link on either coin or kite for the same. Hey Nilesh, if you wish to invest for the short-term, then T-bills have maturities of 91 Days, 182 Days and 364 Days. What this means is that, if you buy a 91 Day T-bill at let’s say, Rs.98, it will mature at Rs.100 after 91 days. The Rs.2 will be your return. Bonds are for durations over 1 year. There are various bonds with maturities ranging from 1 to 40 years. if you buy a bond, you will receive the interest every 6 months to your bank account. The interest rates vary across bonds. I would suggest, you check out this chapter on Varsity: https://zerodha.com/varsity/chapter/government-securities/. I applied for bond for 10000 rs. But my account debited by 10379 rs. Can you please explain ? Hey Hemant, that’s what the exchanges block. Based on the allotment price, you would have received a refund. It’s really a great move. Zerodha keeps on surprising (delighting) it’s customers and create win-win situation. Really appreciate the efforts you and your team is taking !!! 1. In case of emergency, how liquid are they ? ( For FD’s, some bank doesn’t allow to liquidate through E-Banking and one needs to visit the bank ). So how do G-Sec work in case of breaking / liquidating the investment before maturity ? 2. How frequently is the interest paid on the investment ? Hey Ashish, since these securities aren’t listed yet, selling won’t be immediate. You will have to get in touch with us and we’ll help you out. The sales will be through an off-market transaction. The other alternative is through IDBI Samriddhi. 2. The interest is paid out semi-annually. Nishant, T-bills are available for bidding. The bidding window for bonds will open tomorrow. Hey Mithun, is this is a new account, it should be enabled by now. If not then, please create a ticket here: https://support.zerodha.com/. I subscribed for 182-day T-bill on 16-Oct-2018. However, I was issued a 364-day Tbill. I contacted support.zerodha.com to explain the discrepancy, but they are unable to understand the issue. Please help. We subscribed for the bonds but where do we see the allotment once confirmed. Today is Tuesday. Since morning I am waiting for the Bonds to show up on the GSec page but at almost noon, no luck yet. Can you please clarify the timings of when these open and also some clarity around what are the interest payment dates please…. Think you have a great product here on G-sec buying, but a few more options to buy various securtites will help. Also think you need to have modules on Gsec basic and advance enabling people like me to better understand and therefore trade more in the same. Hey Nakul, more types of debt securities will be enabled with time. As for education, check out this chapter on Varsity. Sir if I apply for gsec or tbills through coin from which account the amount Will be debit. Hey Charan, funds will be debited from the equity trading account you hold with Zerodha. I visited the RBI website (https://m.rbi.org.in/Scripts/FAQView.aspx?Id=79#AN2) for G-sec and found that Zerodha is not present in RBI primary dealer list (a list of Primary Dealers with their contact details is given in Annex 2). Why? if you are operating in G-sec, why you are not present in RBI primary dealer list? I have brought a t bill , and paid 20,000 for it. The face value shows,19,668. It is understood that after maturity, govt will pay me, 20,000 for that, 19,668. The question is where is my 332 rupees, as i have paid, 20,000 in full, and the brokerage is 6/10,000. Abhisek, the additional amount blocked has been refunded to your account. Kindly check your ledger for confirmation. Is investing into G-Secs possible for US based NRI’s through NRO-trading account through NRO-PIS? I already have Kite access but not access to coin. i want to invest 1 lakh rupees in Government Securities for 91 days so anyone here to tell me that what is minimum and maximum return i get after 91 days ?